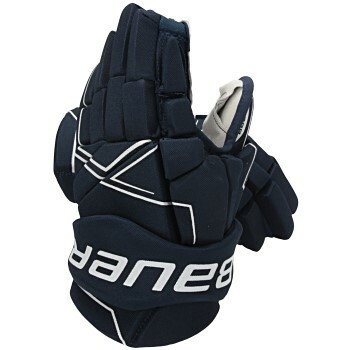 Bauer NSX gloves Senior navy are the entry level model at Bauer and the absolute price breaker. The NSX series is ideal for all recreational players and newcomers to ice and inline hockey. The Bauer NSX ice hockey gloves Senior navy provide solid protection with their medium density protective pads and embedded plastic panels. The ergonomic flex thumb construction provides the glove with good mobility and a good stickfeeling. The 2-segmented fingers of the NSX glove increase agility. The shell of the NSX glove is made of polyester. The embroidered Bauer logo on the NSX ice hockey glove provides a great design. The hydrophobic mesh lining keeps the hand dry so that the stick stays securely in the hand. The NSX ice hockey glove also features the Nash palm.